Pleased to meet you with meat to please you! 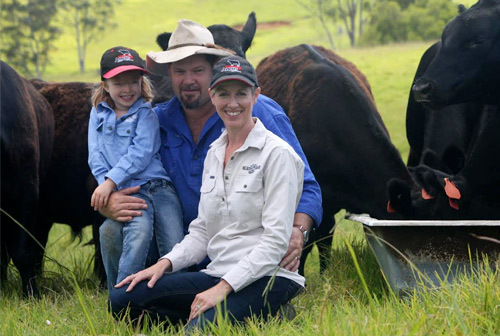 We’re passionate about bringing to you the unique grass-fed Black Angus beef of Maleny. Read about Why grass fed? and you’ll come to see there’s a lot to enjoy from buying beef that’s come from cattle raised properly. Unlike their cousins raised in feedlots for supermarkets, our cattle are brought up properly. They’re healthy, clean and safe to eat. Grain-fed cattle are grown faster, for obvious economic reasons. In fact, they’re given growth hormones. But cattle aren’t meant to eat grain. It’s hard for them to digest it and it can cause tumours and other disorders. One such disorder is “subacute acidosis” where the poor cattle kick at their bellies and eat dirt. To prevent these disorders occurring, the cattle are given feed laced with antibiotics. Instead, we spoil our cattle with natural grasses, molasses and minerals, in line with expert recommendations, to build optimum health of our herd. We all get involved in it. It’s quite the family enterprise! Then we process our cattle at a local accredited processor. We never freeze it! Instead, it’s cryovaced fresh in meal proportions and able to be stored in your fridge or freezer. And we make it easy to buy reasonable quantities for most freezers… you can buy a whole beast, half, mixed quarter or a ‘taste’. We’ll deliver it to you by refrigerated transport direct from our processor. And delivery is free to Brisbane, Sunshine Coast, Gold Coast and Toowoomba.